Ningxia is one of five ethnic minority autonomous regions in China and its official name is Ningxia Hui Autonomous Region, since over one-third of its population is made up of the Hui ethnic minority. The Hui people follow the religion of Islam and so everything, from their elegant traditional dress to their vibrant architecture, has a particularly Central Asian flair. Mosques such as the Tongxin Great Mosque in the city of Wuzhong, the largest and oldest mosque in Ningxia, can be found dotted throughout the province. These mosques are usually a stunning blend of Han Chinese and Central Asian architectural features, demonstrating the hybrid culture of Ningxia. The region itself is located in north-central China, sandwiched between Shaanxi province in the east, Gansu province in the east, south, and west, and Inner Mongolia to the north. While most of Ningxia is made up of unforgiving desert, the vast plain of the Yellow River in the north has long been a fertile centre for agriculture. The thought of sandy deserts may conjure up images of sweltering heat, but Ningxia’s weather is far from scorching! Its climate is largely continental, with long chilly winters and short mild summers. While average temperatures in July range from a comfortable 17 to 24 °C (63 to 75 °F), in January it can regularly plummet to between −7 and −15 °C (19 to 5 °F). In ancient times, modern-day Ningxia almost entirely belonged to the Western Xia Dynasty (1038–1227), which was ruled by the Tangut people. The Tanguts were eventually conquered by Genghis Khan, and Ningxia was incorporated into China proper during the Yuan Dynasty (1271-1368). Very little is known about these ancient people and their mysterious dynasty, although the Western Xia Tombs at the foot of the Helan Mountains have provided historians with a treasure trove of invaluable information. These tombs represent one of the largest imperial burial sites in China and offer a fascinating insight into this lesser-known period of Chinese history. Nowadays several of the tombs have been opened to the public, and are often called the “Oriental Pyramids” thanks to their unusual shape. 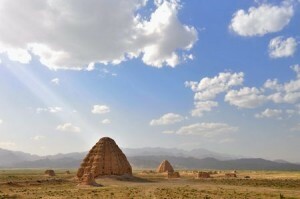 Just 35 kilometres (22 mi) east of the tombs, the regional capital of Yinchuan was once the imperial capital of the Western Xia Dynasty and remains Ningxia’s cultural centre. Since Yinchuan and several other cities used to be important trading hubs along the Silk Road, there are numerous Buddhist sites scattered nearby that were constructed by traveling monks. The most magnificent of these is undoubtedly the Xumi Mountain Grottoes. While this grotto complex is relatively unknown outside of China, it is nationally regarded as one of the finest works of Buddhist architecture in the country. From the Northern Wei Dynasty (368-534) until the Tang Dynasty (618-907), over 130 caves were delicately carved directly into the eastern cliff-face of Mount Xumi and filled with lifelike Buddhist sculptures. The style of these sculptures integrates visible Indian and Central Asian features, acting as a testament to the cultural exchange that took place along the Silk Road. The site’s crowning jewel is a colossal 20-metre-tall (65 ft.) statue of Maitreya(1). Other spectacular Buddhist monuments include the 108 Pagodas near Qingtongxia and the Haibao Pagoda in Yinchuan. 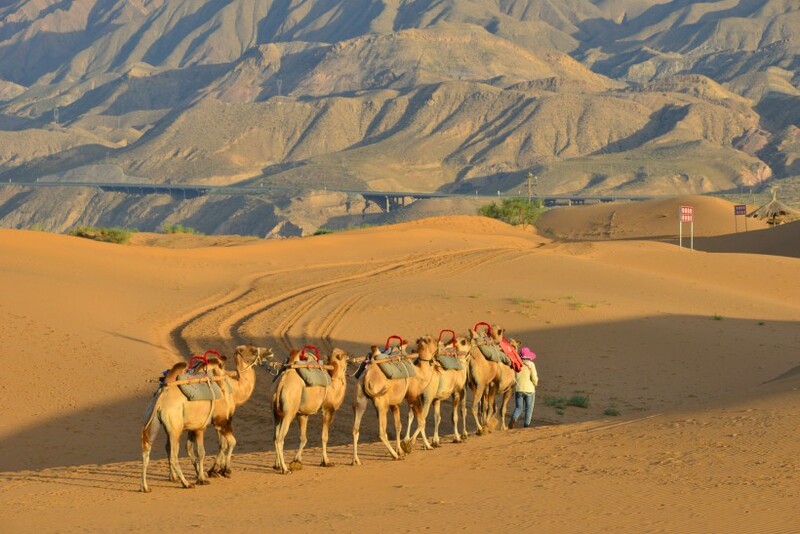 If you’re more of an adventurer than a historian, you may want to sign up for some of Ningxia’s famed desert tourism! The district of Shapotou is regarded as the “Capital of Sand” and is located on the southern rim of the Tengger Desert. It’s home to the Desert Research Centre and one of China’s four celebrated singing sand dunes. The strange shape of the dunes means that, as the wind whips over them, it creates a unique sound that is said to resemble the tolling of a bell or the beating of a drum. It may not sound as pleasant as Pavarotti, but it’s still pretty impressive! Standing atop the dunes, you’ll be treated to a panoramic view of the surrounding desert that is both awe-inspiring and humbling in equal measure. The district also provides access to long sections of the Great Wall, which span across northern Ningxia. Similarly, the Sand Lake Scenic Resort in Pingluo County offers stunning views of both the desert and the resort’s many scenic lakes. 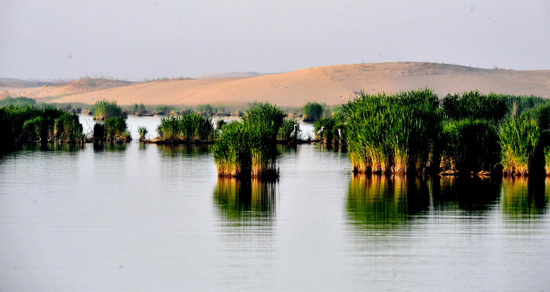 Sand Lake itself is one of the best places for bird-watching in China, as it attracts over one million birds from 198 different species every year. Throughout spring and autumn, migratory birds such as white cranes, red-crowned cranes, swans, and mandarin ducks flock to the lake in order to rest their weary wings. The resort is even equipped with a Bird-watching Tower, where hundreds of people gather and use the high quality telescopes provided to spy on the feathery fowls. Standing at the top of the tower, you could almost say you’ll have a bird’s eye view! 1. Maitreya: In the Buddhist tradition, Maitreya is a bodhisattva who will appear on Earth sometime in the future and achieve complete enlightenment. He will be the successor to the present Buddha, Gautama Buddha, and is thus regarded as a sort of future Buddha.